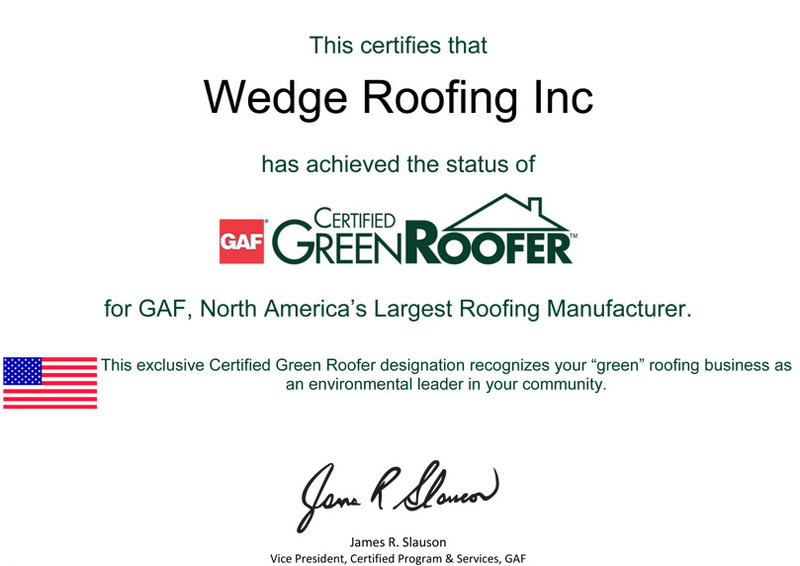 GAF, America’s largest roofing manufacturer, has designated San Francisco Bay Area Roofing Company, Wedge Roofing as a Certified Green Roofer. Developed in consultation with the U.S. Green Building Council this credential recognizes leading roofing companies for their commitment as environmental leaders. GAF only grants the Green Roofer Certification upon GAF Master Elite Contractors with a proven record of both environmentally sound practices and long-term, quality roofing services. 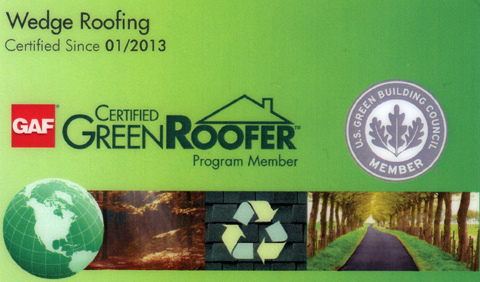 As part of the certification process, Wedge Roofing has participated in US Green Building Council approved training of the many important contributions the roofing system makes to a green home, including the advanced technology behind cool roofing; techniques for improving indoor air quality via proper attic ventilation, preparing a roof for solar energy; and asphalt shingle recycling. As a Certified Green Roofing Contractor, Wedge Roofing has made a commitment to sustainable business practices, offering their expertise in shingle recycling, energy efficient roofing, sustainable roofs, and environmentally responsible roof systems, including Solar Roofs, Title 24 Cool Roofs, Reflective Cool Roof Coatings, Spray Foam Roofing, Cool Shingle Roofs, Tile, Slate & Metal Roof Systems.